Home / First Aid / What Should Your First Aid Kit Contain? 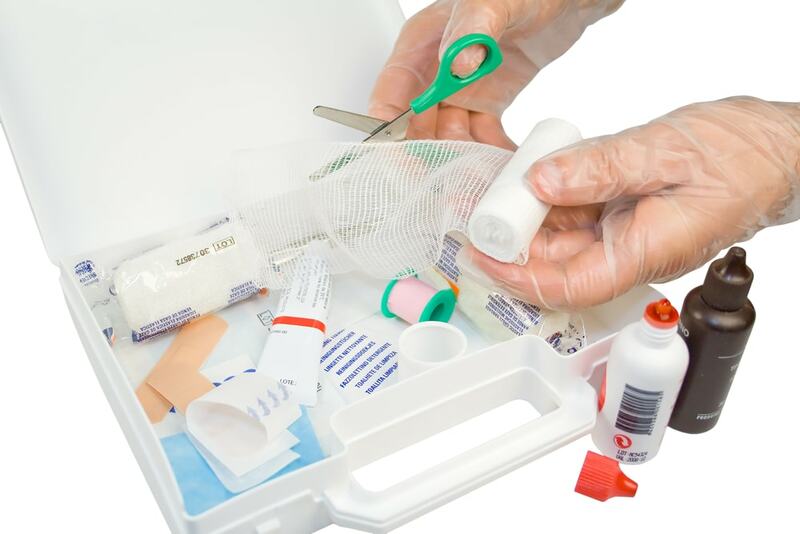 Your first aid kit isn’t just a place to store plasters for accidental scrapes and cuts. It can be a crucial piece of equipment that can help more serious incidents, but only if it is properly stocked. Here is what you should have in your first aid kit for your home and workplace to be fully prepared just in case a medical emergency should arise. Triangular bandages – Can be used to control bleeding or alternatively as a sling to keep injured limbs immobilised. Your first aid kit also needs to be clearly marked as such so it is identifiable and put somewhere accessible. While the above list is what you will typically find in a basic first aid kit, you shouldn’t depend on just what you find there. You should add what it is you need depending on where it is being stored. Make sure your first aid kit has enough bandages for people in your home. If someone in the home does a lot of sports, you may want to stock up on crepe bandages for sprains and strains. If someone in the home has an existing medical condition, consider getting extra items for the kit that may help them in the event of an emergency, for example Epipens if someone has severe allergies. Instead of trying to pack enough for everyone in the office in one pack, if you work in a large office, consider having a few first aid kits for different departments. This will make it quicker to obtain if someone should need it. While a first aid kit is essential, so is first aid training. First aid training gives you the confidence to handle medical emergency situations, including giving you the skills you need to know how to utilise the equipment in the first aid kit. Warp Training Australia delivers first aid courses in Perth that teaches you how to look after others and yourself. We even combined it with a CPR course as well for no extra cost. Get more information about the course here or contact us to secure your place on our next course now.